As of 2017, the average American who made it to the average retirement age of 65 could look forward to another 19.5 years of life. But being able to support oneself financially through that time is another question. After all, the Bureau of Labor Statistics estimates the average 65-and-older American household spends nearly $50,000 per year. If you live to 95 but only budget for living until 85, that is an extra $500,000 gap you’ll need to bridge. Below, we rank the counties with the longest life expectancy. To rank the counties with the highest life expectancy, we used data from the National Center for Health Statistics’ U.S. Small-area Life Expectancy Estimates Project, which estimates the life expectancy for every U.S. Census tract in America. To estimate the life expectancy for the counties, we used the population-weighted average of every Census tract in each county. We ranked the 250 counties with the largest populations. Large difference - The people born in the counties with the highest life expectancy can expect to live almost a decade longer than those born in the counties with the lowest life expectancy. There is a difference of 9.77 years between the top-ranked county and the bottom-ranked county. Large cities score poorly - The top-20-ranked counties have an average median household income of $96,461. The bottom-20-ranked counties have an average median household income nearly less than half that, $45,720. Worst-performing counties tend to be in the South - Of the 10 counties with the lowest life expectancy, five are in the South. 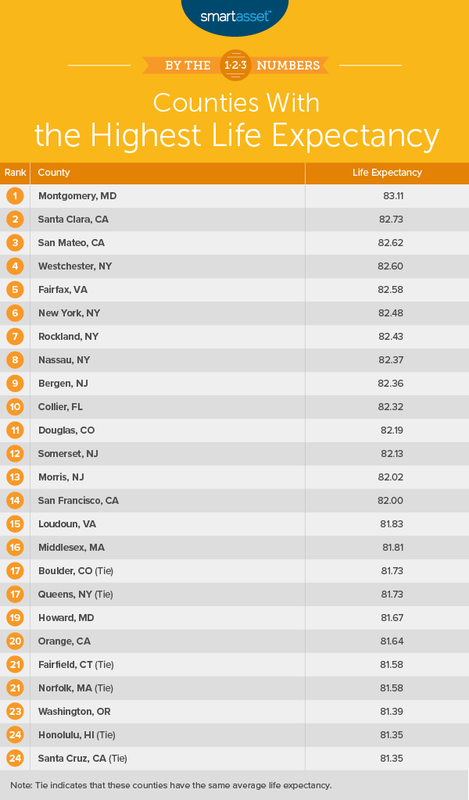 Montgomery, Maryland has the longest life expectancy, according to our analysis. At birth, the average person in this county can expect to live more than 83 years. The average American household (with 2.5 people) spends about $60,000 per year, or roughly $24,024 per person. That means 83 years of living costs about $2 million. One of the wealthiest counties in America, Santa Clara, California, encompasses much of Silicon Valley, including the city of San Jose. Residents born here can enjoy a life of almost 83 years. That means a retirement of 18 years, assuming a retirement age of 65. Residents of Santa Clara may want to look elsewhere for retirement, however. The county has a high cost of living, and California is a high-tax state for retirees. San Mateo, California neighbors Santa Clara County to the west. Residents born in this county have a life expectancy nearly identical to people born in Santa Clara. One potential explanation for the high life expectancy is this city’s high household income. The median household income in San Mateo is $105,667. Residents born in Westchester County, just north of New York City, live 82.6 years on average. This is another place where it might not make the most sense to retire. Westchester is a high-cost-of-living area, and New York is not the friendliest state for retirees. Fairfax County, Virginia encompasses most of the suburbs west of Washington, D.C., excluding the cities of Arlington, Alexandria and interestingly Fairfax itself. Average life expectancy here reaches almost 82.6 years as well. This county has the highest median household income in our top 10, reaching $117,515. The average person born in New York County, better known as the borough of Manhattan, can expect to live for a little less than 82.5 years. This gives Manhattan bragging rights over the other four boroughs when it comes to life expectancy. Queens County, the part of New York City that encompasses the borough of Queens, ranks 18th in this study with an average life expectancy of 81.73. New York dominates the middle portion of this study, taking four of the seven spots between fourth and tenth. Rockland County borders the Hudson River to the east and New Jersey to the south. The average life expectancy for someone born here is 82.43 years, setting up a retirement of roughly 17 years. Using the BLS figures, 17 years of retirement for the average 65-and-over household is equal to $842,214. Nassau County is the first Long Island county in this ranking, lying east of the five New York City boroughs. The difference in life expectancy between someone born here or in Manhattan is 0.11 years, or about a month and 10 days. This county has a median household income of $105,744. Just across the New York-New Jersey border from Rockland County is Bergen County, New Jersey. 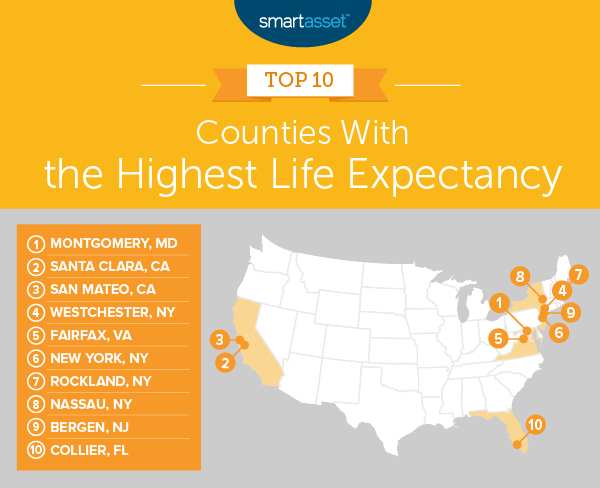 This county has the ninth-highest life expectancy in our study. The typical person born here can look forward to 82 years of life. Florida’s only representative in this top 10 is Collier County, which includes the city of Naples and the Big Cypress National preserve within its borders. Florida is one of the most generous states for retirees when it comes to taxes. To create the final rankings, we found the weighted average of the life expectancy for every Census Tract in the most populous 250 counties. We then ranked the counties from highest to lowest. Data comes from the Center for Disease Control and Prevention. Save as early as possible - At current costs, a 20-year retirement would cost the average 65-and-over household just under $1 million dollars. You are probably not going to manage to save $1 million just by being thrifty. The key is to save early, invest and let compound interest cover most of the ground between you and a secure retirement. Find the right advisor - Investing is difficult. Since the financial security of your retirement depends on your investment strategy, it makes sense to talk to an expert. A financial advisor can help you invest, manage your taxes and help you decide when it’s time to retire. If you are not sure where to find a financial advisor, check out SmartAsset's financial advisor matching tool. It will match you with up to three local financial advisors who fit your investing needs.